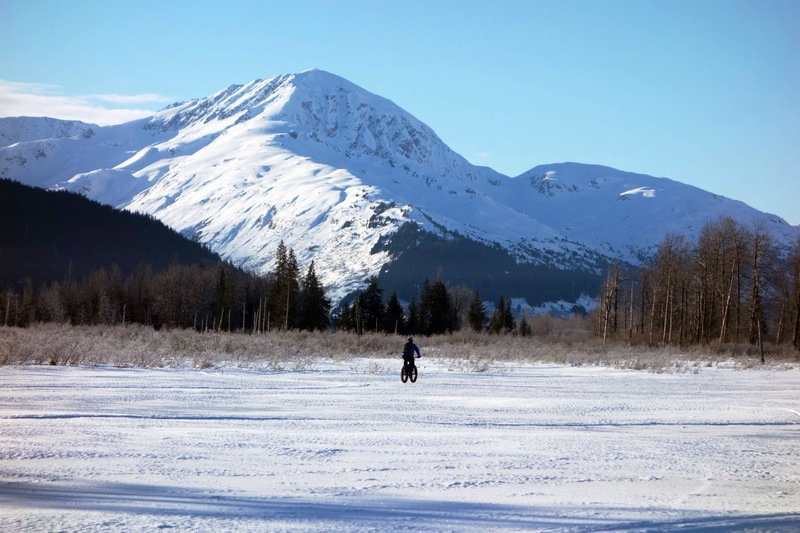 With Beat now making his way to Nome, I'm planning to bounce around various locales in Alaska until the White Mountains 100 at the end of the month. As such, I've been enable to embark on a few great rides amid the work I *am* trying to complete (thus limited blogging, still.) Since my first post-ITI physical effort, a two-hour fat bike ride on Thursday, I went for three more longish rides (first was 3.5 hours, the second was nearly 7, the third on Sunday was another 3 hours) with few issues. My body is well-equipped for endurance right now, but I seem to have no power in areas where I am usually much stronger, such as steep climbs and bike pushes. However, spinning pedals and breathing cold, crisp air has been fantastic for recovery. I feel great. 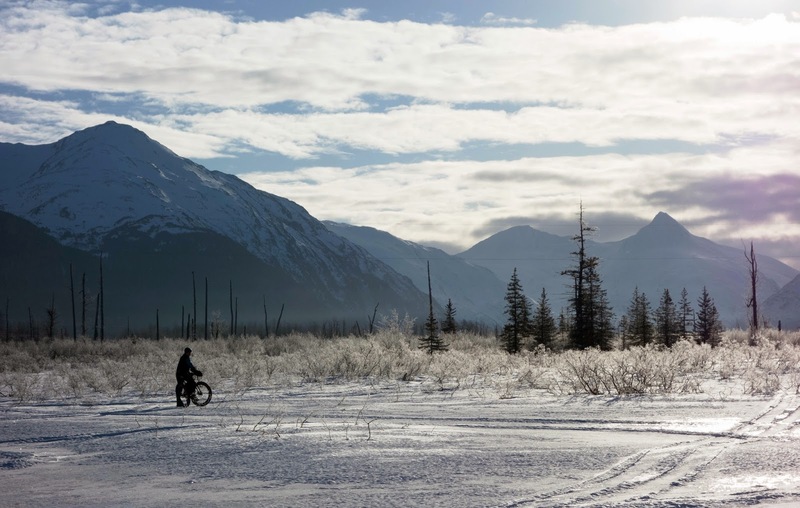 Dave Johnston, the runner who finished the Iditarod Trail Invitational in an unfathomable record of 4 days 1 hour 38 minutes, told me, "You must have had a pretty easy time out there if you're already riding this much." I had to laugh. 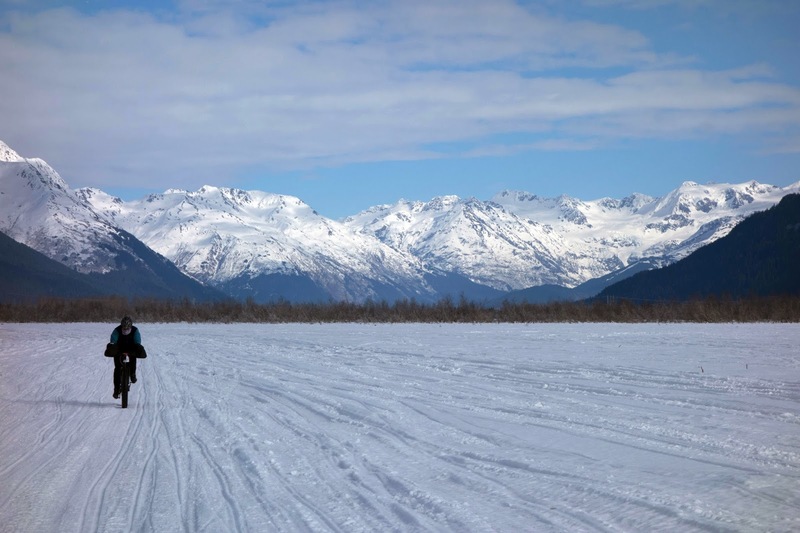 Maybe I did take it too easy out on the Iditarod Trail, but traveling 350 miles on foot was unknown territory to me, let alone doing it in a week, with a 45-pound sled, in highly variable winter weather conditions. I stayed where I thought I needed to stay to survive and reach the finish, which I did. Now I know a whole lot more than I used to. As for Dave, hearing his stories about the experience were absolutely mind-boggling. I think it would be generous to say that I ran 5 percent of the trail (and this was often shuffling, not a whole lot faster than my walking pace.) Dave walked 5 percent and ran 95 percent of the time, often up to 9-minute-mile pace. 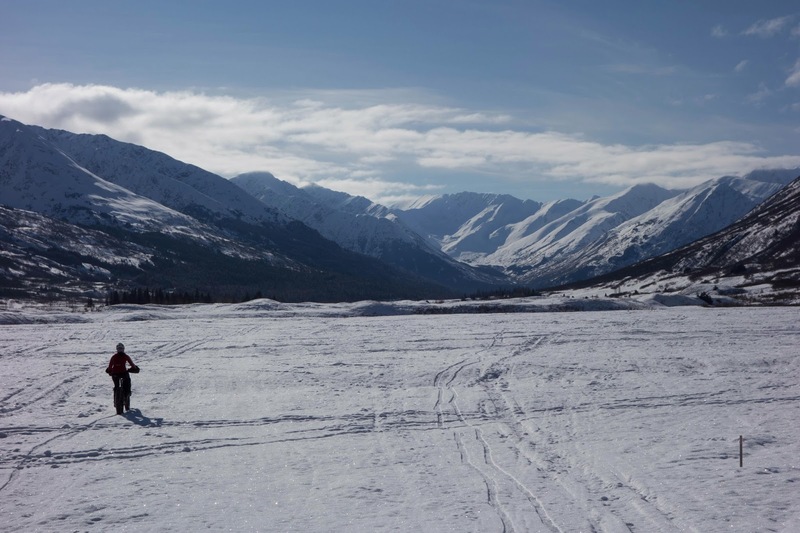 Even after his sled broke into two pieces on the dirt at mile 220, he lashed it together with rope and dragged the shattered remains another 130 miles. And he did it nearly without stopping. He slept a total of six hours, basically only ate just a little more than once a day in checkpoints (because he couldn't eat on the move without getting sick, he hardly bothered with trail food!) and when he ran out of water, he didn't stop to melt snow — he was just out of water, sometimes for many hours. He justified this with the explanation that, back in ancient times, people traveled without stopping for days, and they didn't get food and water every thirty minutes. And they lived and went on the reproduce the offspring that became wimpy us. "People think they need all of this stuff, and they don't," he said. I said, "Dave, what you did out there doesn't seem possible." He replied, "I know. Everyone told me I couldn't do it, and even now people still tell me it's not possible. But I did it." 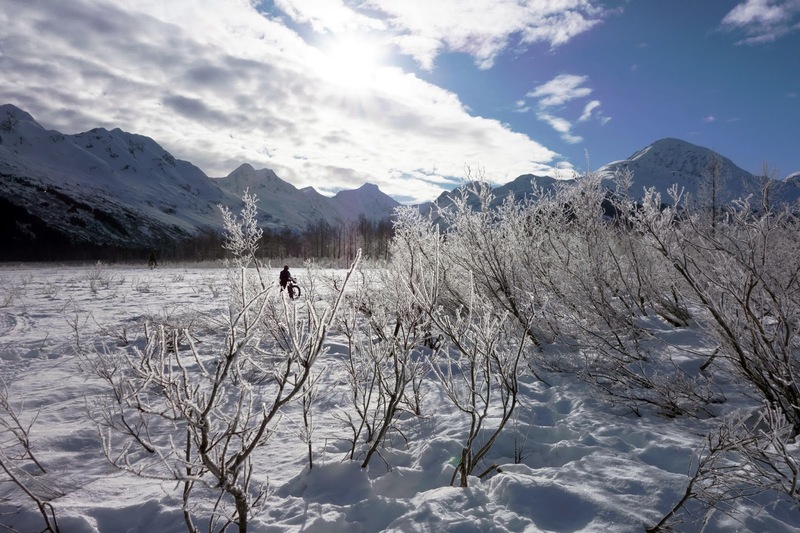 In my admittedly biased opinion, I think Dave's feat on the Iditarod Trail to McGrath is one of the most incredible ultra-long-distance running accomplishments by anyone, anywhere. I hope to write a longer article about it when I get a minute to breathe. Hopefully soon! I'm falling behind on everything. 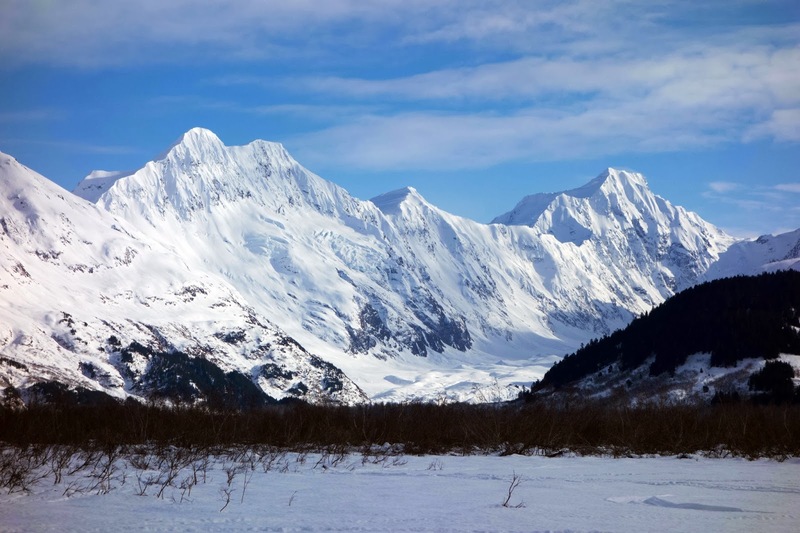 Instead, we crossed the Seward Highway to hit the nicely packed and blissfully quiet snowmachine side, rolling along the valley on punchy but fun crust. Jill shot this photo of me busting across an open creek. 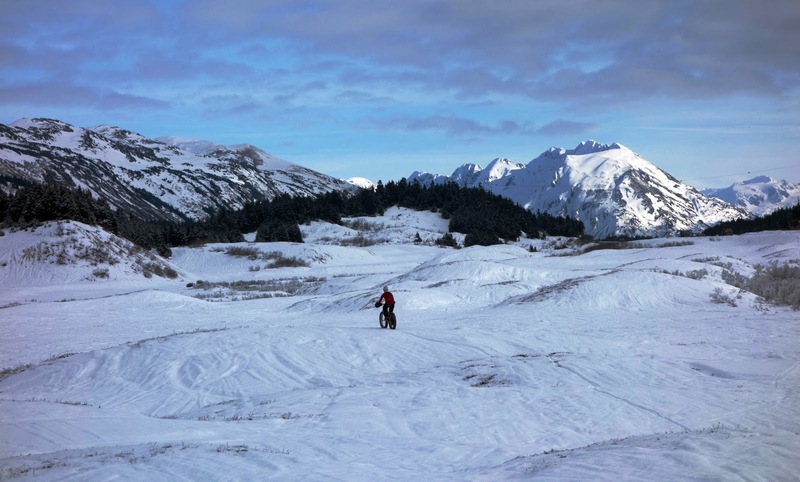 We had a ton of fun doing what often felt like sandy desert / slickrock riding on an incredible bluebird day in the Chugach Mountains. 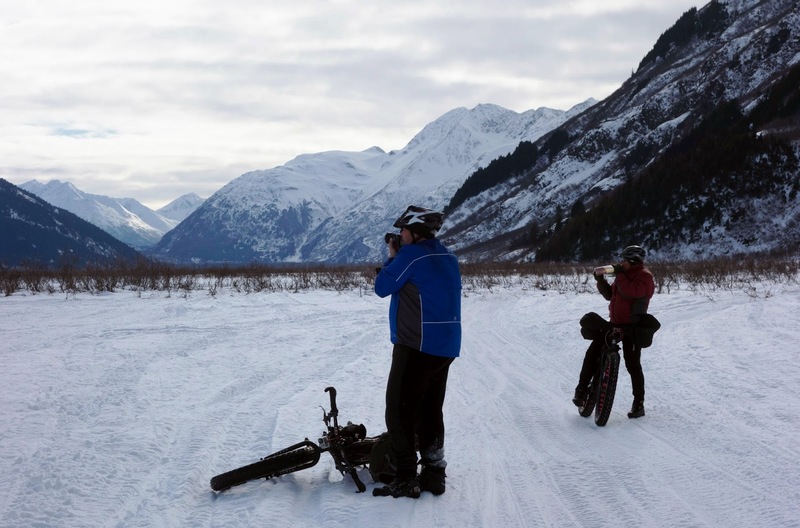 On Saturday, Jill and I joined her friends Scott and Sue near the Portage railroad station to look for a winter route to Spencer Glacier. We initially tried to follow a faint snowmachine trail next to the train tracks, but found mainly breakable crust that seemed reluctant to support my weight. Scott, who is a big guy, was also busting through, but Jill and Sue fared much better. All of the women were about the same size, so I can only assume crust-floating technique is an acquired skill that I currently lack thanks to my limited snow bike practice during the past few years. 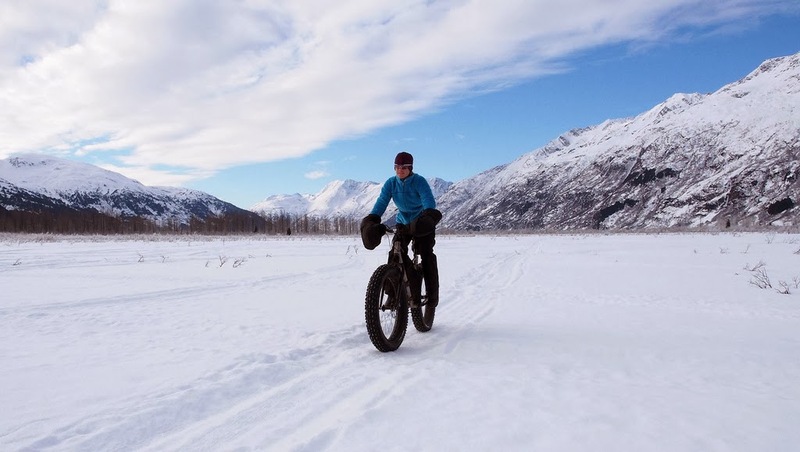 I tend to mash pedals and feather the handlebars too much, which quickly plants one of the tires deep into the snow. Even the frustrating trail scouting took place in a beautiful setting, with sparkling hoarfrost and mountains surrounding us on all sides. 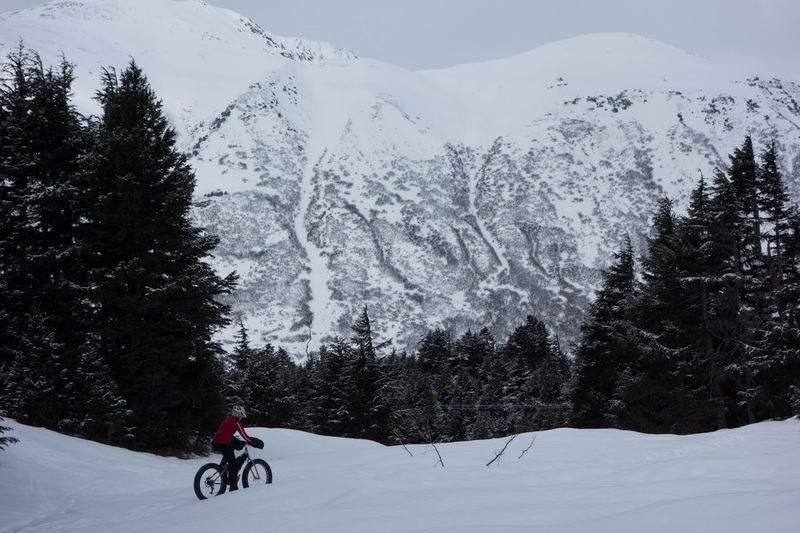 Temperatures were in the single digits rising to the low teens, and winds were light, which meant ideal conditions fat bike travel. About 2.5 miles in, it was beginning to look like we'd have to bushwhack across the valley to locate the main snowmachine track, which we avoided because we knew it crossed open water in several spots. 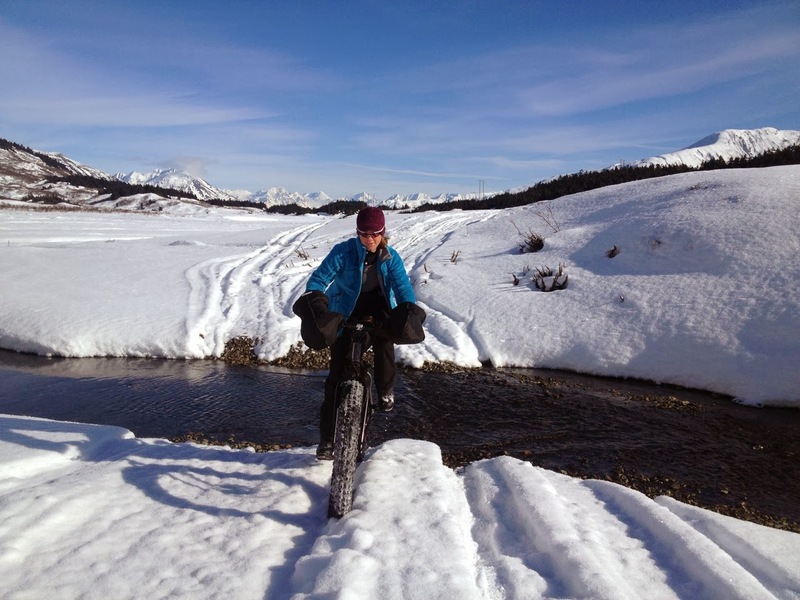 At the time, Jill was a half mile ahead and seemed keen on crossing the valley even though it meant also crossing the Placer River, which was likely to contain a lot of open water and thin breakable ice. As it turned out, she just wanted to scout out a potential route and head back to the railroad tracks if necessary, but all I could see were sketchy ice crossings in our future and I wanted no part of that. Scott and Sue also weren't thrilled about our current bike-pushing route, so the three of us opted to turn around, cross the highway bridge, and try the snowmachine trail. Jill continued forward. After an hour of essentially backtracking, we made it to the other side of the valley and a veritable snowmachine highway. Riding was super fast and life was good. We crossed a few open or thinly iced-over streams, but thought we had it made until we hit the first open braid of the Placer, which looked to be about knee deep even at the shallowest crossings. I had brought a pair of lightweight waders with me, which allow me to keep my feet dry in stream crossings up to thigh deep. But this first crossing was more than a hundred feet wide, and there was no way for us to share one pair of waders. We walked up and down the bank, looking for an ice bridge, when we encountered a snowmachine tour group crossing the river. They splashed down as water rose well above their own boots, and I walked over to talk to the guide while he waited for the group to make it across. He told us there were five such river crossings, and they were all about equal depth. Ice shelves on both sides would prevent us from riding bikes across, and even if we were willing to ride or wade, the risk wasn't worth it. Wet feet for hours in single digits is a good way to get frostbite. So, we turned around. 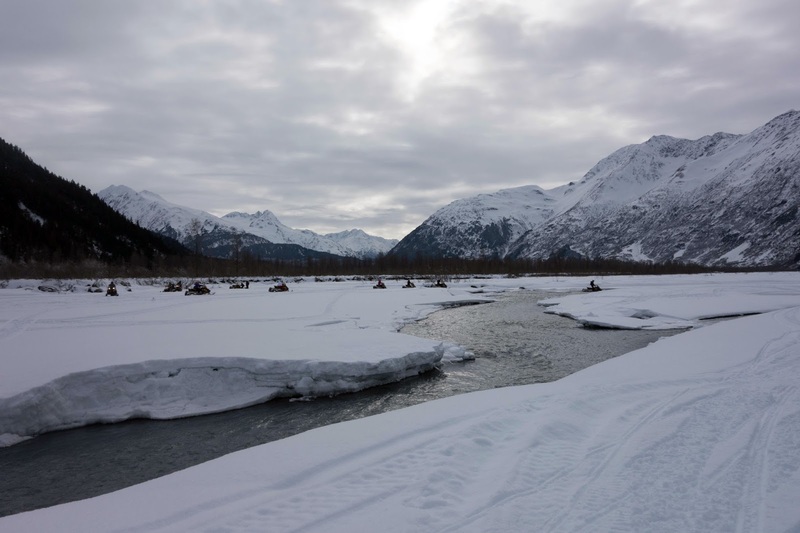 And of course, Jill — who chose to stick close to the tracks — was able to cross the river on railroad bridges and successfully accessed the Spencer Glacier. Scott, Sue, and I were a bit bummed to put in all that effort for a "DNF" (all-in-all, we rode or pushed thirty miles over seven hours, albeit at a relaxed pace with lots of stops.) But I can't deny that it was a grand day out in a beautiful valley. I would have liked to see some blue ice, but I don't regret leaving the railroad tracks to follow the more aesthetic trail. The scenery was incredible. And no shortage of picture taking opportunities, either. Scott took this picture of me riding back down the valley. This encapsulates what I love so much about being here: Wide open spaces, wild terrain, mountains, big skies, and an environment that makes accessing these beautiful places deeply challenging — and worth it. awesome stuff! do you have a gear list from your ITI adventure? (especially one on a fatbike?) i'm sure you've posted it in previous years and i just haven't found it.... i'd love to know what you carry on this trip! Looks like some beautiful scenes to ride in. I would love to see yours and Dave's gear lists for the ITI side by side, just for a fun comparison. As always, an enjoyable journey along with Jill.